Last December, I had been experimenting with soup because that’s comfort in winters in New England. I mean, really, soup is just comfort anyway. I had played with Broccoli Cheddar soup that had been inspired by Panera, except I was really trying to not give myself a stomach ache. The recipe was a hit and I’ve made it a number of times, sometimes varying the amount of broccoli and onion in it and sometimes varying the cheese if I think I can handle it. Most recipes like this one come around from a desire to get food out of my fridge before it goes bad. Outside of my own food behavior – I hate throwing food away. It’s a waste of money and I’m reminded of a time when food was scarce at home and I know that’s the case for many today. A few weeks ago I stocked up on chicken broth because I had a coupon for BJ’s and figured this winter could be the season of soup, or chili. This was an excuse to open a box and get some squash out of my fridge, now I need to figure out what to do with the rest of the box. 1. Peel cooked squash from its skin. I used acorn squash and butternut squash that I had roasted. 2. Cube squash so that it will fit in a food processor. Puree squash. You could also use a potato masher to breakdown squash by hand if a food processor is not available. 3. Chop half a yellow onion into small pieces. You don’t need to dice or mince them unless you prefer that size. 4. In a medium pot, add a tablespoon of olive oil and chopped onion. Cook until onions are almost translucent. 5. Add 1 cup of chicken broth to the pot and bring to a light boil. 6. 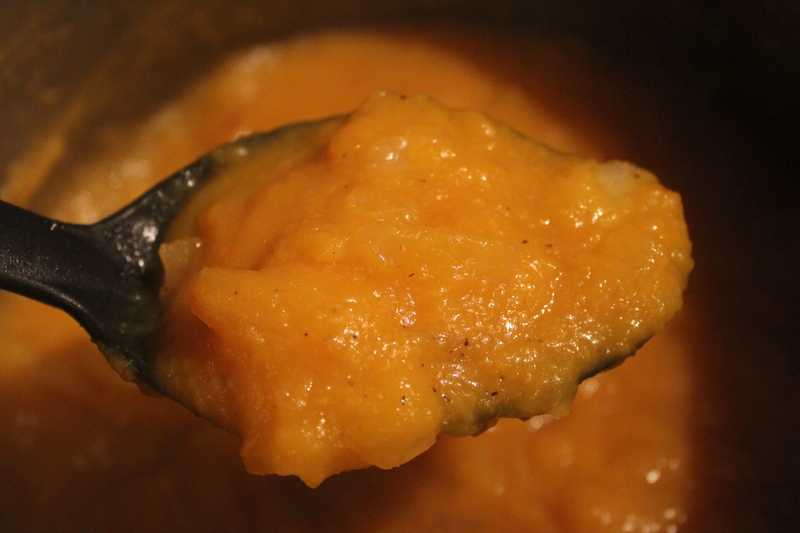 Add the pureed squash, about two cups – it’s ok if it’s a bit under or a bit over, that will just make the soup thicker. 7. Wisk the squash into the mixture until completely incorporated. 9. Add 1 teaspoon of cinnamon. One thing I want to do in the New Year is to cook more. Now that I have more space, I’m looking forward to getting more creative in the kitchen and figuring out how I can broaden our horizons at the dinner table. What do you like to do with your leftover vegetables? Would soup be a good option?